You want that coveted top page ranking. You know you need visibility. You also know that search engine optimization (SEO) is the only way. First, research and find powerful SEO strategies that really work. Second, put everything you have into using and escalating these strategies. Breathe a sigh of relief. You have come to the right place. 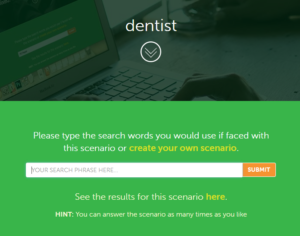 Optimize Your Dental Keyword Research With A Powerful Yet Mostly Undiscovered Tool. Using a tool to determine the best seed keywords is often only useful if you know the best seed keywords. Remember, your competition is likely using the same seed keywords as you. In order to get a leg up, you have to know how to find different and better. To use it, create a scenario (a phrase a patient would use to find your dental office). Click the ‘create my scenario’ button to receive a customized link. This link will go out to anybody and I mean anybody you can send it to; family, friends, current patients, mailing lists, etc. 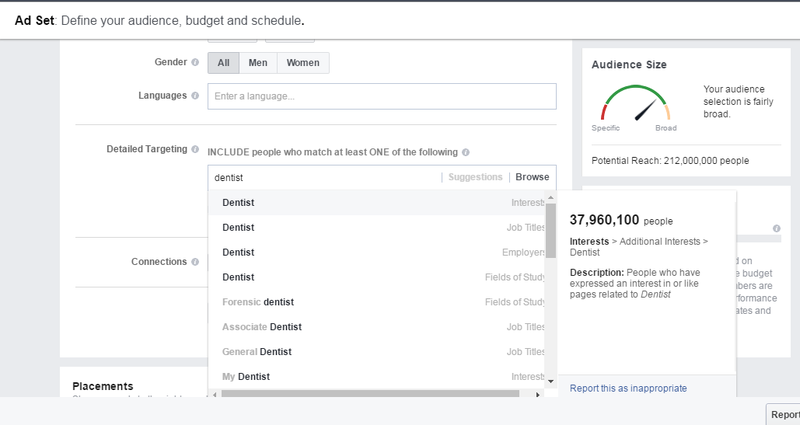 and they will input they keywords that come to mind when searching for a dentist. 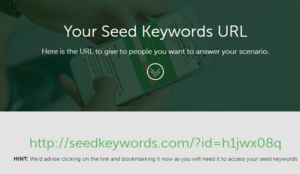 You then receive a valuable list of unique seed keywords that won’t be used as much or at all by your competition. Title and description tags are the most important keyword tags for search engine ranking. They need to be filled with proven, quality keywords. If you get this right, you can easily find yourself shooting up to the top of the first page. 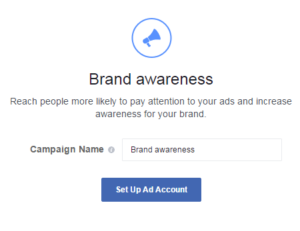 The trick is, it has to be something that draws people in and makes them want to click. Those ads you see in searches are vying for the most competitive keywords and if you are seeing them, then they have been successful in outshining their competitor’s ads. These sites have usually conducted a huge number of experiments to maximize clicks. They are powerful they work. Study these ads to see what copy you can use to maximize your own clicks. Let’s look at some ads for the keyword ‘best toothpaste’ to see an example. Description: A ranking of the best toothpastes to eliminate stains, whiten teeth and give a deep clean. This is a magical place for prime yet unique keywords. 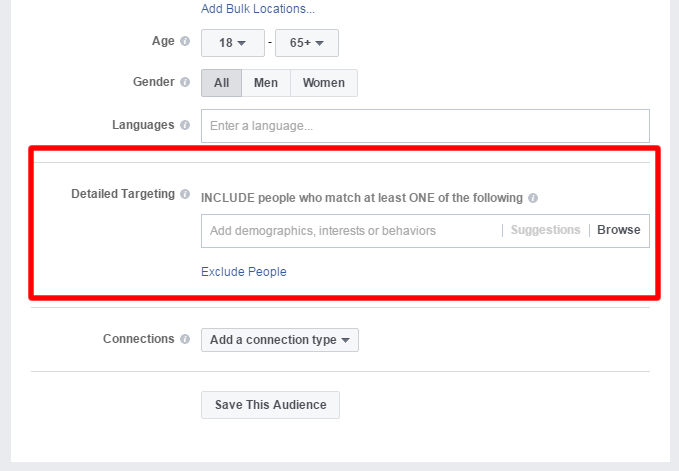 There are upwards of a billion users who add to Facebook’s data collection of interests and demographics. This is powerful information that you can get for free. 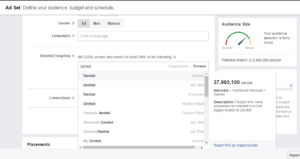 Just like with Google’s Keyword Planner, you do have to go to their ad creation software but it is worth it. 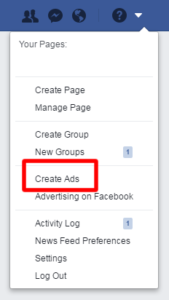 Going through the ad creation process provides access to Facebook’s data collection, which you can use to mine some of the most useful keywords that will lift your search engine ranking. 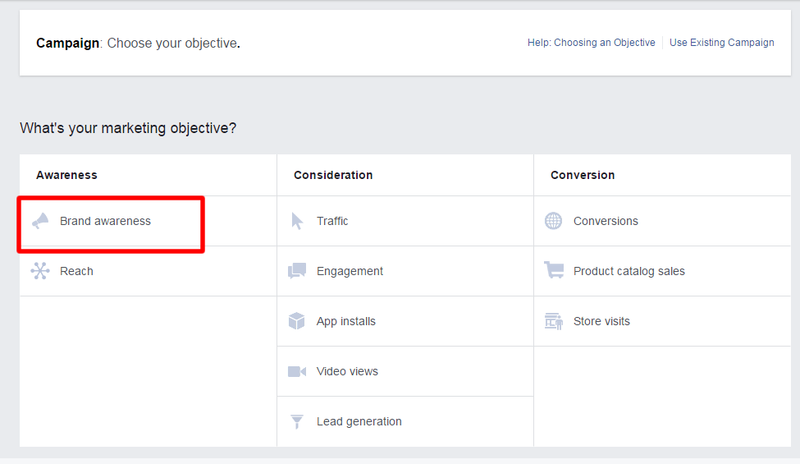 Find the section specifically called “Detailed Targeting” and type in a keyword. 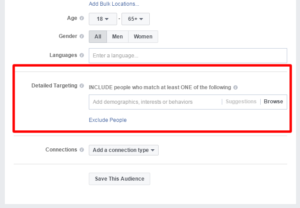 Rejoice in the keyword suggestions backed by Facebook’s mined data. 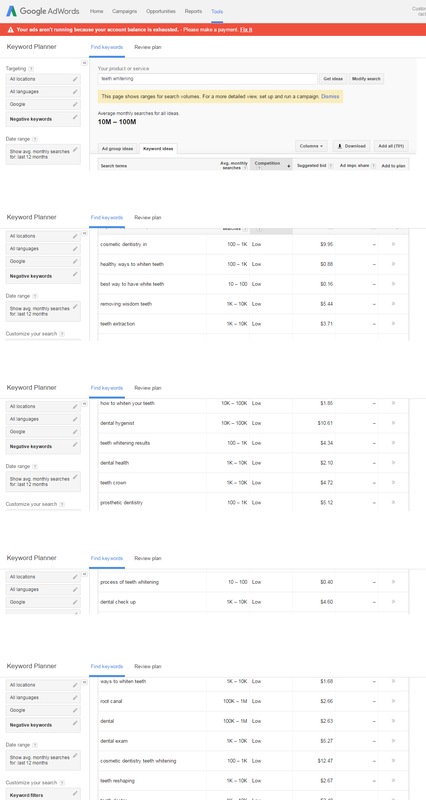 Now take these to the Google Keyword Planner! Don’t confuse this with cramming as many keywords as possible into the title. All keywords should flow naturally and organically. No, this is using a technique that extends the value of your seed keyword to increase your search engine traffic. Long tail keywords, not only count towards your seed keyword but also give you a leg up on a keyword phrase that has less competition. When you add a tail to your keyword, you add value to the seed keyword with the traffic that the tail brings in. 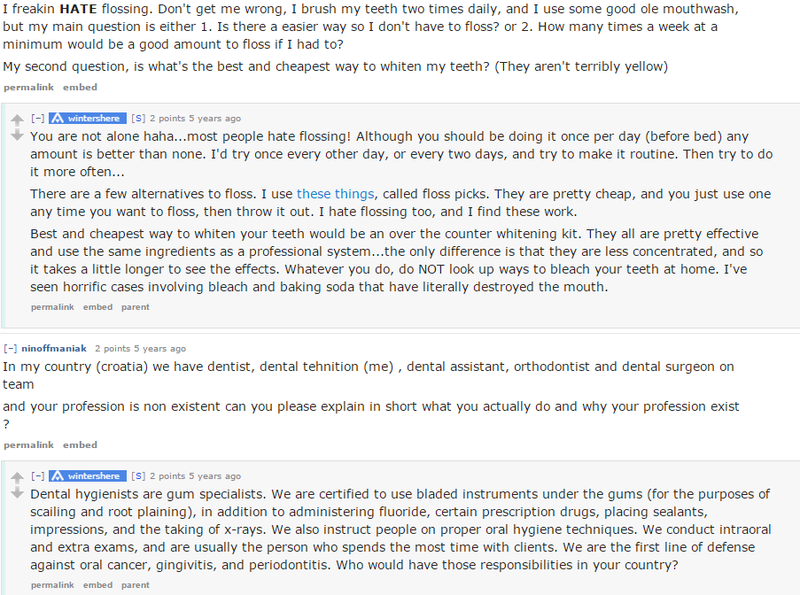 If your target keyword is ‘teeth whitening,’ then obviously, you want to include that in the title of your post. 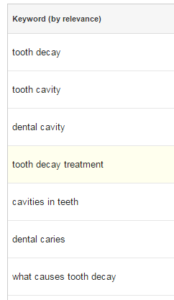 But if you look up ‘teeth whitening’ in the Google Keyword Planner, you will find the highest ranking phrases available to add that your competition might not think about using. You can see that ‘teeth whitening results’ has less competition but still a good number of searches per month. It’s a magic formula that your competition likely won’t know about. Don’t sell yourself short or leave yourself in the wake of your competition. Add those long tail keywords in your post title. 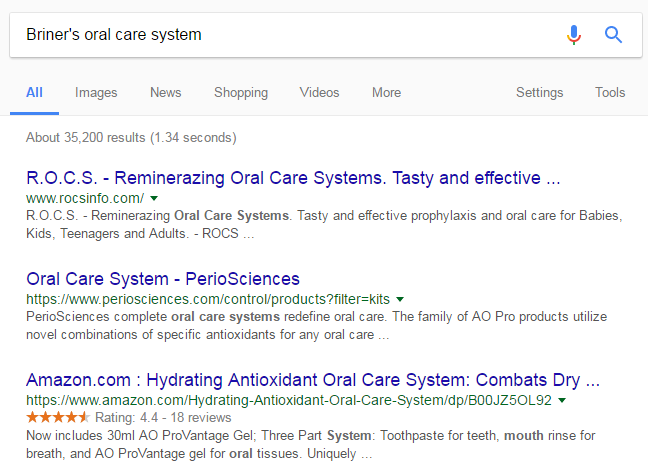 Here is another vast source of unique keywords for your dental SEO that your competition probably doesn’t realize exists. This is one of the most useful ways of finding untapped keywords out there. Google Keyword Planner has its place but Wikipedia is a treasure trove of prime keyword ideas that you will be hard pressed to find anywhere else. The difference between the two is that GKP sticks to variations of your seed keyword. For example, take a look at ‘cavity.’ You can see that there isn’t a lot of variation. 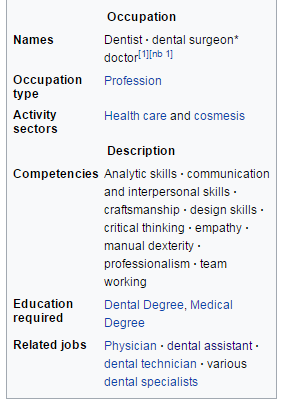 Wikipedia, on the other hand, is run by humans. Every keyword you come across there is something a human mind came up with. This is exactly what you want! 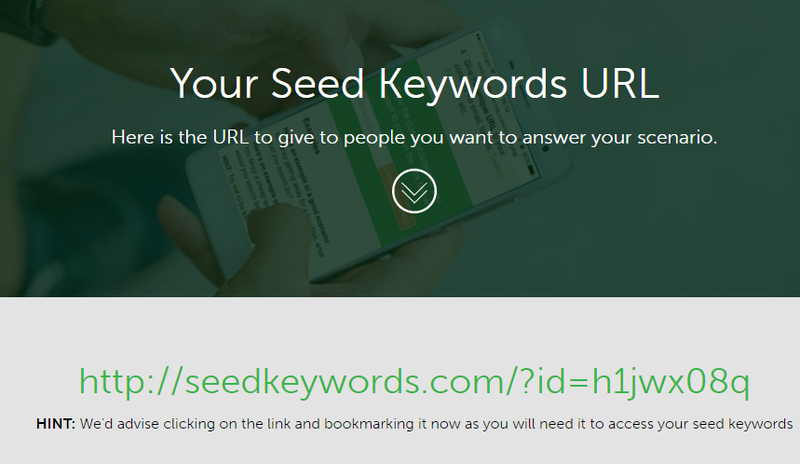 This will provide a long tail keyword that applies to your seed keyword but is more than just a similar variation. 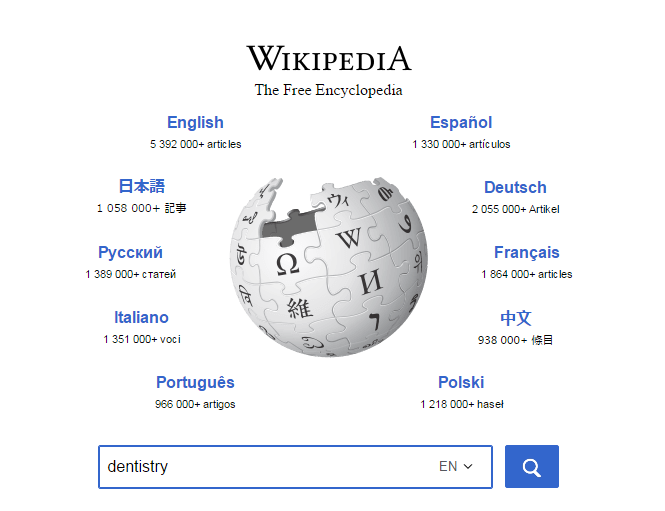 Type in your keyword in the Wikipedia search bar. We’ll use ‘dentistry’ this time. 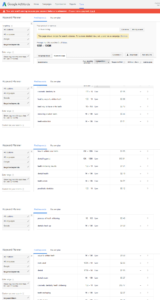 Now we can look around the article for specific areas that have keywords jump out at us. If you have the time, click through some of the internal links and go through the same process in those articles. You will have a huge list of man-made keywords that gives you an edge in search engine rankings in no time. 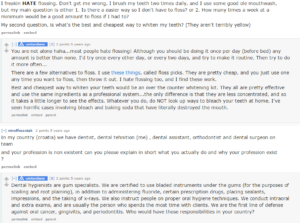 You might wonder if Reddit would be useful for Dental SEO if you don’t know much about the site. It’s a good question but the great thing (and sometimes the bad thing) about Reddit is that there is pretty much everything and anything on the site. This is also a source of manmade keywords as this is another human run site. Go to the search bar of reddit.com on the top right. Type in your keyword. We’ll use ‘dental hygienist’ for this example. Look to see if there are any communities and in this case, there is one. Communities will give you endless threads with a wealth of keywords right there at your fingertips. If there are no communities, scroll through the search results to find threads in other communities related to your keyword. Scroll through and skim the content looking for words that pop up again and again. Listen closely because if you can figure this out, you have a side door into front page rankings. Any keyword or phrase you invent will put you #1 in the rankings for that keyword, which leads to more traffic, backlinks and we all know those open the door to more competitive keywords. So how do you invent a keyword exactly? You come up with a name for a signature product or service. Maybe you have a teeth cleaning system that is unique. Maybe one of your dental hygienists has a certain way of giving advice that you can slap a name on. However you do it, you will be the only dental office showing up for that search and word catches on fast for things like that. For example, say a dentist wants to be on the front page for teeth whitening in his area but there is stiff competition. In this example, our dentist, who we’ll call Dr. Briner, has a home oral care system that he has patented. 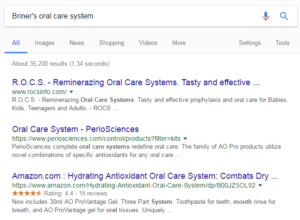 He names his product, Briner’s Oral Care System and posts a blog post that describes the benefits of the product in detail using the name in the title and organically throughout the blog post. Using the unique name of his product because his name is attached to it, he is going to be above anything that currently shows up under that search. That’s it. All it takes is to create a unique system or product and name it. Voila, your very own keyword. 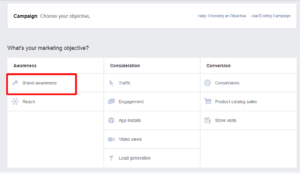 Want a quick way to increase traffic without doing much work? Revive an old blog post. If you come across new and/or useful information that can be added to an old blog post, use that to your advantage. While you’re there, see what other information can be updated and if any graphics can be changed or added. Now with this updated and improved version of your blog post, send it out to your email list and post it on social media with a title describing why it’s being updated. 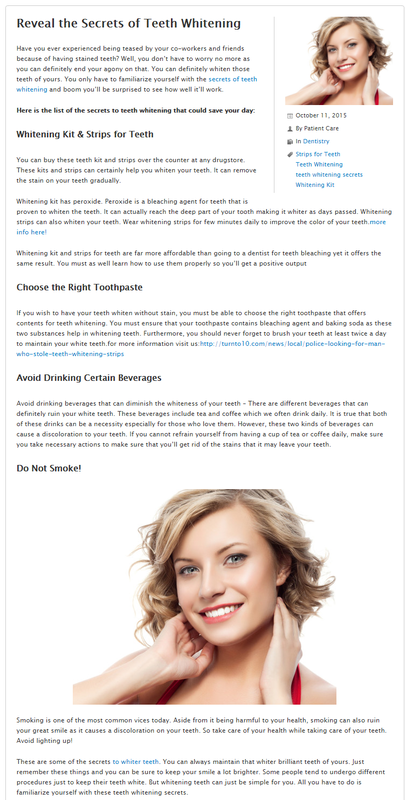 If you have a blog post called “The Complete Guide to Toothpaste” and some new information has come out, a new toothpaste that you completely back is on the market or even better, combine this with inventing your own keyword as we previously discussed with a product or a service and include it in the updated post. Now it’s ready to go and you’ve done much less work than you would have if you had done a completely new post but now you’ll get even more traffic. Very useful for gaining traffic and more backlinks. 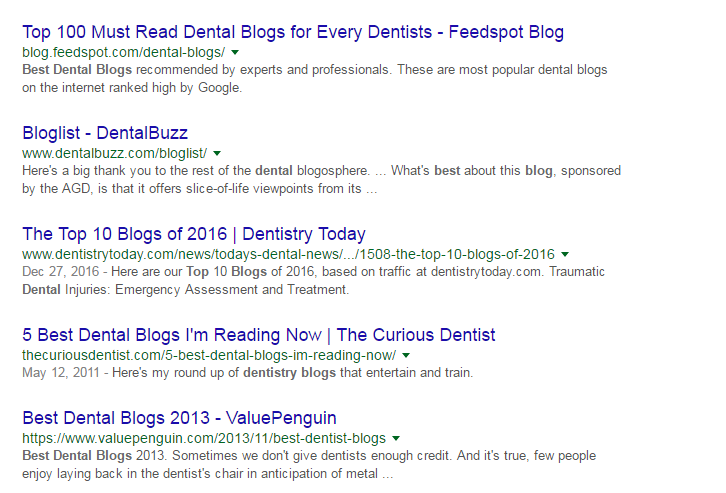 Curating content can be a very useful to your audience and a valuable dental SEO resource. 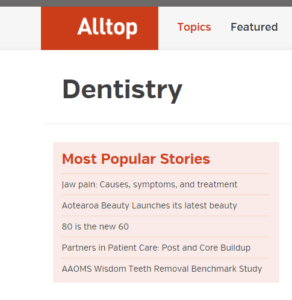 However, the fact that so many dental blogs curate content these days does put a saturation on the practice. This means you have to stand out. Your content curation should focus on how it benefits your audience. What does your audience get out of your list of content? This has to be a valuable resource. 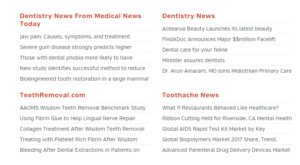 In the screenshot above, you see lists of the best dental blogs. That’s all well and good but your audience isn’t going to know why they should read these blogs. Change the direction. Don’t just show the ‘best blogs’ or the ‘best posts.’ Have a focus. Have a useful theme. Stay focused on how the audience benefits. Something like, “The 10 best toothbrushes rated by North American Dentists” or “The Best Dental Apps to Keep Up With Your Oral Care,” etc. These are things your audience and patients can actually use and it will get more clicks and more traffic. If the article is a longer article, make the subheadings benefit focused as well. For example in a comprehensive guide on proper brushing using curated content, you could have a subheading that says, “2. How using the right toothbrush can immediately improve your brushing technique,” with links to several dental blogs discussing that very topic. This tells them why they want to keep reading. They will benefit and learn information they can use right away to help their teeth. People don’t want to sift through random information. They want to know that reading your curated content will be worth their time. Make information useful to your audience and you become a valuable resource that they will come to again and again. One SEO strategy that is gaining more ground is longer content. And there is a reason. Google loves longer posts with high-value content and the longer the better. Short posts are pushed aside for content rich posts that are on average around 2000 words. Look at most search results that are content driven and you’ll see that the majority are long, in-depth blog posts. Why do long posts work? First off, long posts show Google that you’re providing in-depth information for searchers. This works because search engines, especially Google, sees this as valuable and extensive information that adds to the quality of the internet. Not only that, but your audience will be invested in your post. Longer content gives you more of a chance to appeal to their emotion. The longer it is, the more likely they are brought in emotionally, and the higher the chance is they will share it. Shorter articles and blog post don’t have enough time to build any kind of emotional connection. Therefore, they are least likely to be shared and will definitely be indexed less by search engines. Do you know about the First Link Priority Rule? Many people don’t. Most assume that every link is counted and pay most attention the anchor text in the link contained in the body of the page. But here’s the thing, Google only cares about the first link they come across. If there is an identical link later in the page, they count it as identical and skip it. That’s the First Link Priority Rule. You need to know this so you can start putting more valuable anchor text in the first link to any given page. In most sites, this will be your menu links. Those are the most important internal links for any page. You want to put anchor text with relevant keywords in those links, right there. 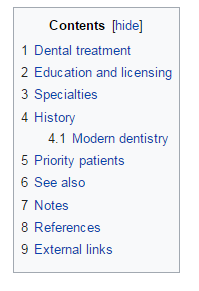 For instance, most dentists have a ‘services’ link in their menu, like the one above. The anchor text in that link usually just says the name of the link. Instead, putting ‘dental services’ or ‘dental clinic services’ as the anchor text would go a long way with search engine rankings. If you only remember one thing from this section, it should be to always put relevant keyword anchor text in your menu links. It must be repeated, it is that important. YouTube videos are a powerful tool and if you aren’t using them, you should start now. And considering that Google owns the popular video site, it’s a trend that’s not likely to change anytime soon. 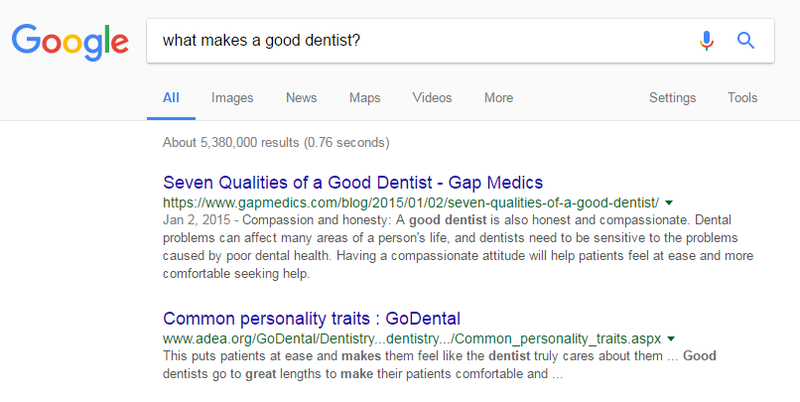 Once you have your channel set up and start putting up dental videos of various kinds, you can now use the description of the video to generate more keywords for your business through a site owned by Google! If you want these descriptions to build your search engine ranking, you have to make it like a mini blog post. It needs to be more than a paragraph and ideally a few hundred words with keywords and long tail keywords organically thrown in there. This will give you a huge leg up on your competition as they most likely aren’t taking advantage of this. Most people throw in a short description, rarely using any keywords and just leave it, thinking that the views of the video are the valuable part. Video views are definitely a big thing and something to strive for, but your real magic will be in that description. Your title and description are going to be what counts with Google, not the video and not the number of times it has been viewed. 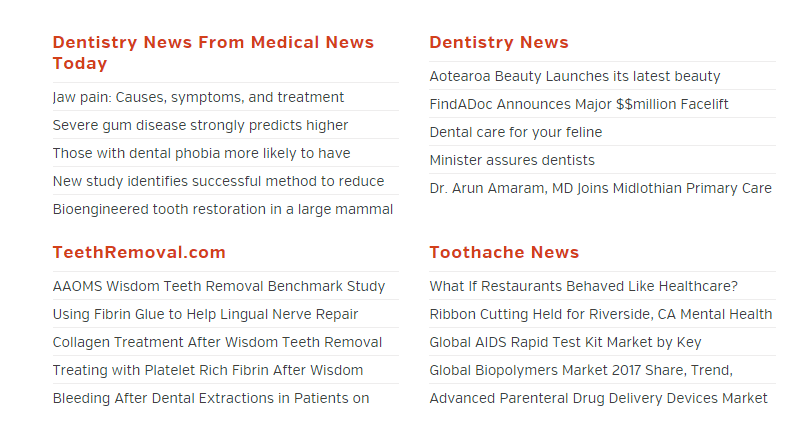 What better way to get more coverage for your target keyword and dental SEO as a whole? Have you ever received an unsolicited email and been annoyed or somewhat confused as to what they want? Something like that usually puts a wrench in a person’s focus and they wonder what the purpose is, so many things are already vying for their time. Cut that feeling off at the pass when you do any kind of email outreach and answer their questions right away. They want to know why you’re emailing and why they should listen to you. Who are you, anyway? Of course, email outreach is an important process that is needed in acquiring high-value backlinks, however, there is a better way to do it. Telling a person why they should read your email using the word ‘because’ immediately shuts down any confusion and annoyed feelings because they don’t have to guess. When you answer an anticipated question, you make yourself look more authentic and legitimate. The better you look, the more likely you are to get a response and a positive one at that! Let’s look at two examples and see which one makes you feel better and more amenable. Which one would you rather answer? Doesn’t it feel better to know why a person is emailing instead of just asking you to do something? This makes the invitation to check out your post feel much more genuine and being genuine gets way more results. They say that anything after the first page of Google is dead space and might as well be on page 50. 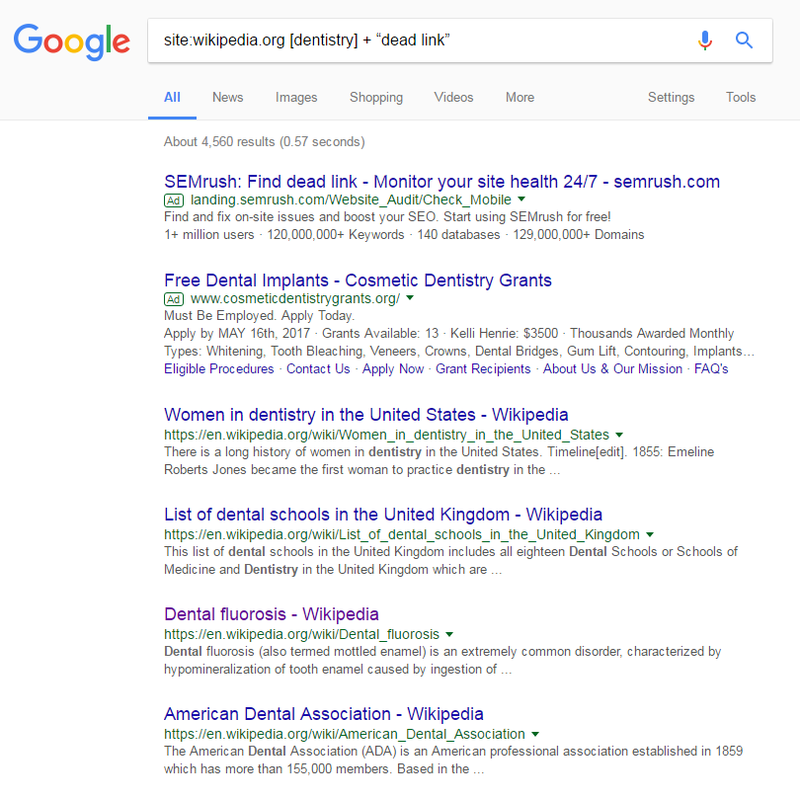 The truth is that page 2 until about page 10 or so are filled with dental SEO opportunities that contain abandoned content that was previously at the top of page 1. Some of these are people who started really good sites but got overwhelmed or bored and others are people who quickly moved onto other projects or other sites. What’s great about this is that the content is still highly valuable and abandoned so that it can become new again. There are many paid sites that will allow you to check for backlinks for the specific page but if you’re in a hurry, a quick free backlink checker like smallseotools.com will let you know what kind of links go to the site in general. 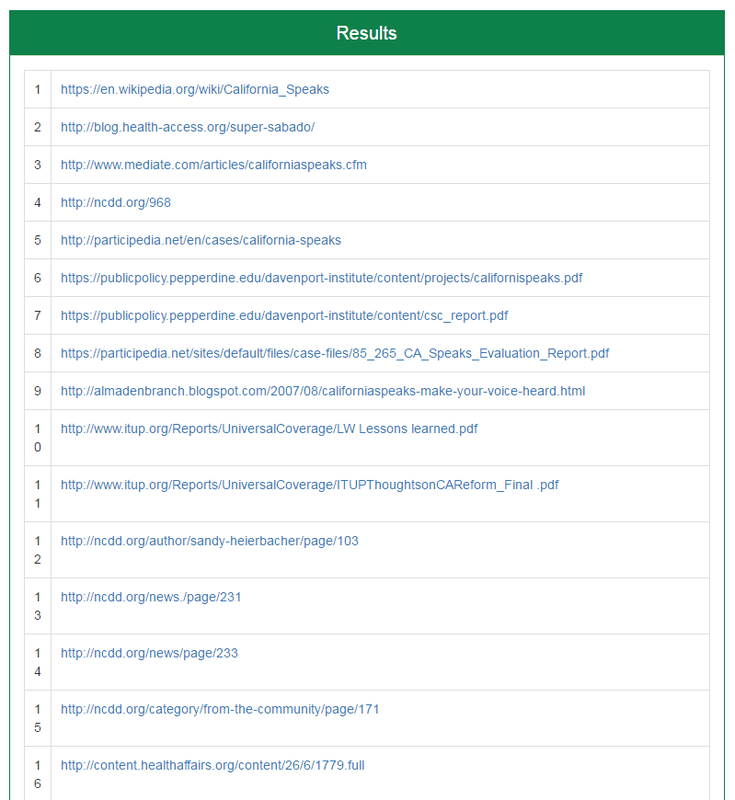 Using smallseotools.com, we can see that this site has a good amount of backlinks from quality sites such as mediate.com and government sites as you can see here. All you have to do is change the content to suit your dental practice and your area. Maybe make the article a big longer, update the information and voila, you have reverse engineered the article. Your last step is to do some email outreach. Let the authority sites know that they are linking to one of your favorite articles and that you now have a similar article that is more thorough and up-to-date. Your challenge is to now go out and find a relevant article that you can update somewhere between page 2 and 6. 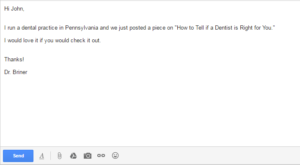 What can we say about using broken links to build your dental SEO with a quality backlink list? Broken links are search engine friendly and flexible. If you can’t tell, they are a huge asset. Finding broken links, on the other hand, isn’t so easy. Dead links on Wikipedia don’t immediately get deleted. They get tagged, which is good because it makes things oh so helpful for you. The tag is put there to let the editors know to check it before removing it. The reason it is tagged is because sometimes a link goes dead temporarily and they want to give it time. Luckily, this system makes things very easy. You will jump straight to the part of the page that has the ‘dead link’ tag. There it is. We now have a relevant dead link. You could change the link on Wikipedia to point to your page but that only counts as a single link, which doesn’t hold so much power. No, what you want to do is exactly what we did in the reverse engineer method. Input the dead link into your preferred backlink checking software and find the high-quality backlinks linking to the dead link. Then it’s time for some more email outreach. You know what to do. Oh, you’re going to love this one. This is one of the best tools you can use. All you have to do is search for your niche and a bunch of relevant, high-quality blog posts will pop up with news and articles using your keyword. 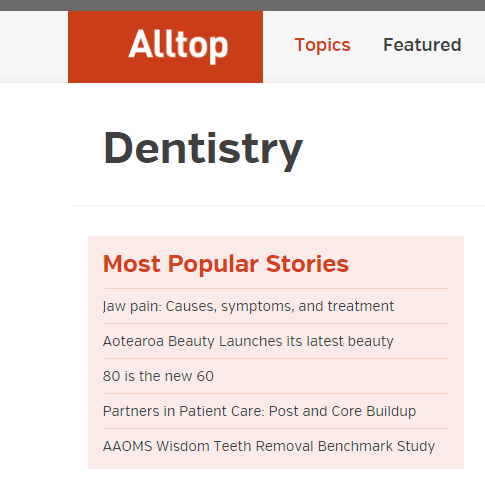 A list of the best and most authoritative blogs in dentistry as seen by search engines. This is incredibly vital in building your email outreach list for building backlinks. So, the main reason that we are so focused on authoritative sites and high-quality links is because of a ten-year-old Google algorithm called Hilltop. Basically, this is Google’s way of eliminating black hat SEO tactics so that garbage content doesn’t end up mucking up the works. Hilltop looks for relevancy, quality and how in depth the content is to determine whether it is useful. This includes not only the sites that link to you but the sites that you link to, as well. It has lasted for ten years for a reason. It works very well because it is so stringent. This is why your inbound and outbound links are so important. When you link to a page, it should be relevant to your content, there should be a reason. Linking to any site just willy-nilly with no relevancy and no quality will always penalize you with Google. They learned their lesson the hard way dealing with low-quality link farms that linked anywhere and everywhere trying to game the system before Hilltop was implemented. It is also worth noting, that Google will see your site as a quality site and a helpful hub of information if you only link out to high quality, authority sites. The standard practice now says that you should link to at least 3 authority sites in every blog post and article you post to your site. Now you know how to climb Google’s Hilltop. You want all of your pages to be top ranking on Google. If not, those pages can weigh your dental SEO down. If you have pages that aren’t performing as well, send some of your own link juice to them! Go to Google Search Console and find the keywords where any of your pages rank lower than page 1. Always check ‘position.’ This will show you the average ranking for each word. From here, you want to find keywords that have an average position of 11-30. 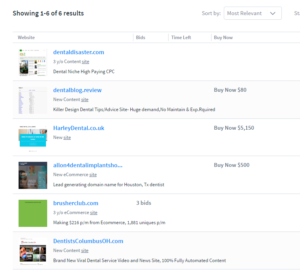 Then, you want to identify which pages are doing the best, these are the authoritative pages of your site. A premium backlink checker like ahrefs.com will help you do that by checking each individual page. Now that you know your strongest pages versus your weakest pages, you can send the link juice by adding the weaker pages’ links on the authority pages. And there you have it, you have ‘link juiced’ up your site. 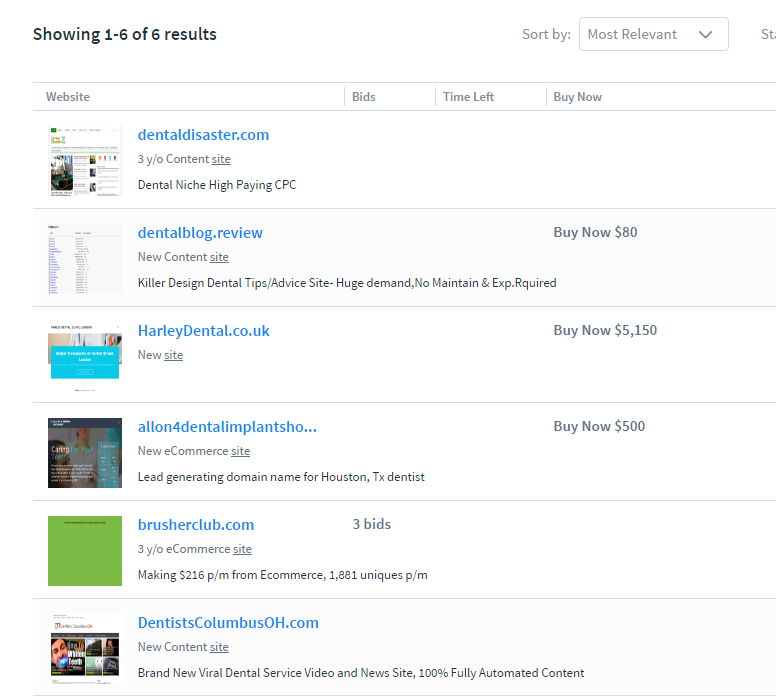 This is an easy one but also a powerful tool to have under your dental SEO belt. Link building only really works well if you can accrue a lot of relevant, quality links from sites that are considered authority sites. Sometimes it can seem rather daunting to try and find authority sites that will also provide a backlink opportunity. Enter ‘best of’ blog posts. ‘Best of’ blog posts are curated content that reviews the best and most authoritative blog in a specific niche. They are a wealth of information for building your backlink list. They are very easy to find. This is the perfect way to build a high-quality list of blogs and sites for guest posting or building relationships that could lead to lots of high-value backlinks and definitely raise the level of your dental SEO. Have you seen those blog posts full of advice, information and knowledge from a handful or more of experts? Those are called Expert Roundups and they are the perfect way to exchange backlinks and social network sharing. This is a perfect strategy for any Dental Clinic blog. Roundup dental experts outside your area and away you go. 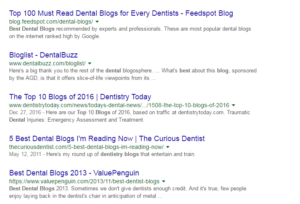 Here is a really good example of a dental expert roundup that shows up at the top of search engines. All the featured experts link to the article and since they are authorities in the field, those are quality backlinks, very high value. 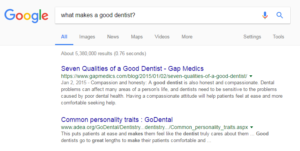 The good news is that the dental industry is not saturated with these roundups yet, which means you have a lot of leeway with the subject matter and available experts at your disposal, which can bring your dental SEO to a whole new level. There is very little work on your part, it is a group effort and you get huge benefits from the promotional part of it. The more influential the expert, the more traffic and social media shares you will get right away. Start using those ‘best of’ lists to find the best experts and input their contact information into a roundup contact list. Have as much of the important information as possible in your spreadsheet. Next, find a topic that could have more than one answer or opinion. This is clearly a somewhat subjective subject and will draw your audience in with curiosity on what the experts have to say to see if anything helps them with their own opinion. Once you have these things clear, email your experts. Once you’ve published, send another email to the experts with a link to the post so they know it’s live and what to share and link to. And now you have backlinks, social shares and quality content. As you know, backlinks are becoming more valuable every day to search engines, especially Google as they lead the charge on search engine indexing. We have discussed a few clever ways to find some good, relevant and high-quality backlinks but we leave you with one of the most powerful backlink tools you can use. And it’s another free one. Flippa.com is a website that sells sites that have built value but the owners are no longer interested in running. Know why this is valuable? Because in order to list their site, site owners have to fill out all kinds of things to show why they are valuable and why somebody would want to pay what they’re charging. Not only do they show successful keywords and content but they also show the sources of their backlinks. 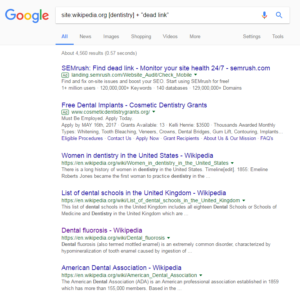 You get to see the blueprint of how a successful site built their dental SEO and you can tap into their resources if you know how to do it. It can be a freaking goldmine. Go to flippa.com make sure you’re on ‘Websites’ and then click ‘All’. Enter your targeted keyword at the keyword prompt. 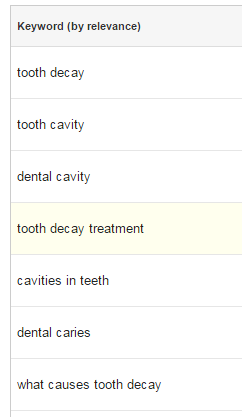 Let’s look and see what the keyword ‘dental’ brings up. This one shows a wide presence on Google. 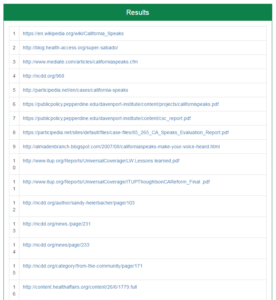 If you click on the links to its SEMrush profile, you get a few ideas for outside the box yet relevant backlinks. With more niche websites like dental clinics, you have to get creative with the keywords but we have shown you how to do that in this article. This is a tool that you should use at least once per week to get maximum effectiveness and continue to try your unique keywords as you mine them. There you go. Everything laid out right in front of you. 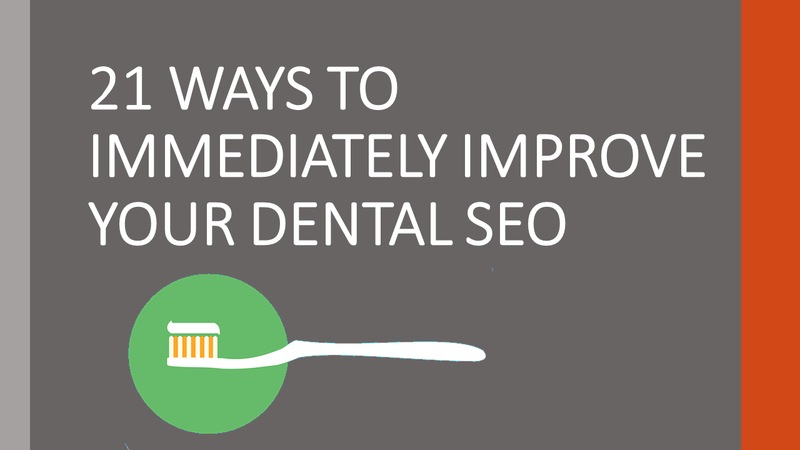 Go forth and utilize all these exciting and effective dental SEO strategies. Thanks for sharing this great article Adam! In which situation would you prefer to upload video content rather then written text content? Nowadays… you should start to consider both. YouTube is the #2 search engine in the world, and video content is becoming more and more popular. If you have the time, and resources… you should consider both! from this blog. These types of dental updates are really effective to my family members.